Maple Leaf Foods has a new MVP Most Valuable Protein promotion! Score $5 e-credit card when you buy any 4 participating Maple Leaf, Maple Leaf Prime, Schneiders, Hygrade, Larsen, Sunrise, Mitchell’s or Burns products and submit your receipt online. Purchases must be made between February 6 and March 26, 2017. All four participating products must be purchased at the same time and be shown on same sales receipt. The sales receipt must be submitted at appehtite.ca. Each entry is valid to redeem a $5 pre-loaded e-credit card. 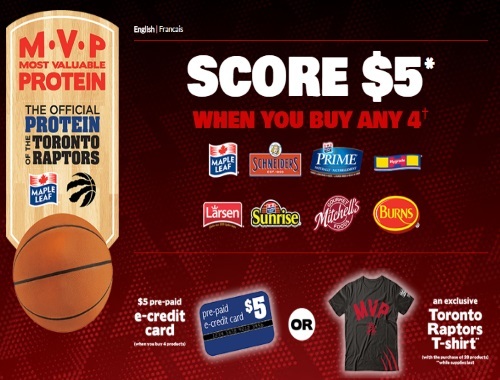 If consumer correctly enters in promotion five times, participant may choose to receive a $25 pre-loaded e-credit card or an exclusive Toronto Raptors T-shirt instead. T-shirts available while quantities last. T-shirts available while quantities last. Maximum of five promotion entries permitted per household. Maximum of one T-shirt or $25 pre-loaded e-credit card from appehtite.ca per household.